In last week’s article I reviewed the main developments that contributed to the positive share price performance of the top four gainers on the MSE. However, due to space limitations, it was not possible to highlight the other notable developments that characterised the equity performance and trading activity across other companies. Following the 8.5 per cent increase in 2017, the share price of GO advanced by a further 11.6 per cent during the past 12 months, closing the year at the €3.96 level after reaching a fresh multi-year high of €4.10 in mid-October shortly following the announcement of the planned sale of up to 49 per cent of the share capital of BMIT Technologies plc via an Initial Public Offering. The partial sale of GO’s subsidiary was approved by shareholders during an Extraordinary General Meeting on December 3 and the prospectus was published yesterday following approval by the Listing Authority earlier this week. GO shareholders now await the eventual decision of the Board of Directors as to the planned use of the proceeds. In the explanatory circular and also at the AGM, GO had claimed that the proceeds of up to €49 million will be used “to deliver returns to shareholders”. As such, assuming the IPO is successful and GO manages to dispose of the maximum amount on offer, the market then awaits the extent of the distribution of the windfall gain and also whether this will be distributed immediately following the IPO being concluded in February or whether the special dividend will be combined with the customary annual dividend in May. Fimbank plc conducted a large rights issue at a price of $0.55 in the first half of the year with the strong participation of the two principal shareholders – Burgan Bank SAK and United Gulf Holdings Company BSC. The share price skidded by 26.8 per cent in the first six months to a low of $0.505 but the equity rallied by 48.5 per cent during the past six months to end the year with an overall gain of 8.7 per cent. The sharp recovery in the share price in recent months commenced following the publication of the 2018 interim financial statements on August 14 when the Fimbank Group reported a significant improvement in pre-tax profits to $7 million. Unfortunately, the bank did not issue any statement in recent weeks to update the market on the progress in its turnaround strategy and whether it managed to register further recoveries of some of the old impairments recognised in previous years. One of the main developments in 2018 was the transfer of the 49 per cent equity stake in Lombard Bank Malta plc from the Special Administrator of the Cyprus Popular Bank Public Co. Ltd to the National Development and Social Fund. On November 9, 2018 the NDSF informed Lombard of its firm intention to dispose of all or part of its shareholding which is conditional and dependent on market conditions, regulatory approvals and other conditions which are currently being evaluated by the NDSF. Earlier this year, in a media article, the NDSF had stated that the resale of Lombard shares “was likely to be through a combination of an institutional pre-placement and a public offer”. This is possibly one of the key events taking place during the course of 2019. IHI’s share price had another disappointing year with a slight decline of 1.1 per cent to the €0.62 level. The equity touched a high of €0.70 in 2018 during the month of June shortly after the company declared an interim cash dividend of €0.02 per share at the start of the month. 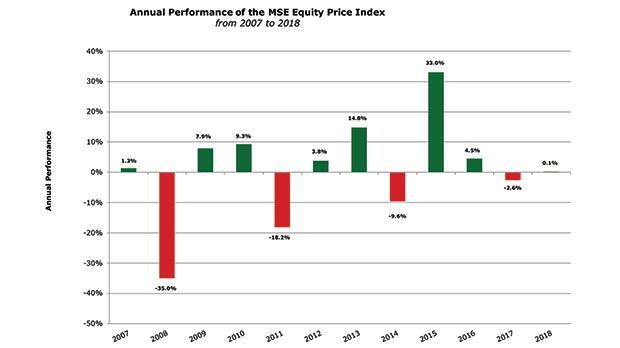 Although IHI reported a further increase in its EBITDA to over €60 million during 2017, the share price eased back to the €0.60 level during the second half of the year. During the last few days of the year, IHI confirmed its intention to redevelop the Corinthia Hotel St George’s Bay into a six-star resort as well as to develop two luxury serviced residential blocks in close vicinity. Furthermore, IHI explained that the Marina Hotel and the Radisson Blu St Julian’s hotel will both remain operational until such time that more definitive plans are made in the years ahead. Although both Medserv plc and RS2 Software plc closed lower with declines of 8.7 per cent and 9.1 per cent respectively, these equities recovered during the second half of the year from the steeper losses incurred during the first six months following specific announcements related to the awarding of new contracts and their strong business pipeline. During the first half of the year, Medserv announced that it managed to penetrate the Egyptian market and it was also successful in signing a second contract with a multinational oil and gas company for exploration activities taking place offshore Cyprus. However, the share price dropped by 20.6 per cent during the first six months as a result of the publication of the disappointing 2017 financial results on 30 April (showing EBITDA of €4.3 million) and possibly due to the uncertainty arising from the decision taken by the two largest shareholders (holding a total of 65.5 per cent of the issued share capital) to source a strategic purchaser for their stake. The share price recovered by 15 per cent during the past six months after the company announced that it was awarded a major contract in South America for USD30.5 million for a period of only 15 months from January 1, 2019 to March 31, 2020 and after Medserv re-affirmed its financial forecasts of achieving an EBITDA of €6.8 million in 2018. This would represent the start of a good turnaround from the weak financial performances in 2016 and 2017. The share price of RS2 Software was on a downward trend for most of the year. However, the equity rebounded sharply following the publication of an Interim Directors Statement on December 17 highlighting the strong business pipeline across all its geographical markets as well as in both its business lines. RS2 also claimed that it successfully penetrated the North American market with a solid pipeline of work for clients including Tier-1 financial institutions. Moreover, RS2 also made reference to potential prospects in Northern Europe as well as with Pan-Asian clients apart from increased business in South America and the Asia-Pacific region. BOV was undoubtedly the major disappointment for equity investors after the strong operational performance was marred by the huge provisions for litigation. The bank is potentially involved in a number of litigation cases which understandably dominated investor sentiment in recent months. In fact, following the publication of the 2019 interim financial statements on July 31 in which it was revealed that a €75 million provision was taken and that the dividend was being suspended for the 2018 financial year, the share price tanked to multi-year lows. The largest case relates to the ‘Deiulemar’ litigation arising from the trust business with a maximum exposure of €363 million. Moreover, another source of disappointment for BOV shareholders was the failed attempt by Unicredit S.p.A to dispose of its 10 per cent shareholding in the bank which fell through in November. Besides the listing of Trident Estates plc in January 2018 following the spin-off from Simonds Farsons Cisk plc, the only other addition to the equity market during 2018 was the small IPO of Main Street Complex plc. Following the upcoming IPO of BMIT Technologies plc which will be concluded by mid-February, other new equity offerings could follow in the months ahead should BMIT have a successful debut once its shares commence trading on the secondary market. Meanwhile, various other notable developments are expected to take place across the equity market in 2019 such as the offer by the NDSF of Lombard shares, the rights issue by Trident Estates, the possible acquisition of SmartCity (Malta) Ltd by Malta Properties Company, the possible awarding of new contracts for both Medserv and RS2 as well as any resolution on the search for a strategic purchaser by the two large shareholders of Medserv and whether MIDI will finalise a deal with Tumas Group for the development of Manoel Island should this project be approved by the Planning Authority. However, the main focus by many investors will be on BOV to see whether further provisions will be required in respect of the litigation cases and whether dividend payments are resumed or delayed further until any additional clarity on these material items becomes available. © 2019 Rizzo, Farrugia & Co. (Stockbrokers) Ltd. All rights reserved.